When I choose a course, nothing can withstand My resolve. And Atma is the Lord. Prema, Prema - nothing else. So spoke Baba in 1962 on a Shivaratri evening. The magazine, Sanathana Sarathi, was then entering its fifth year of publication. 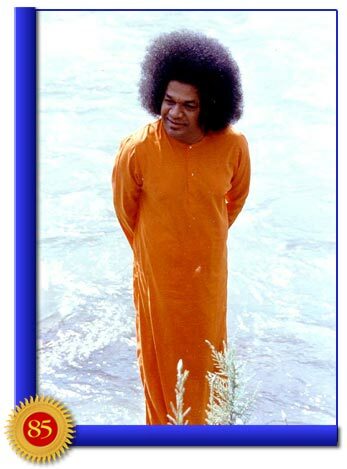 Baba showers Prema, seeks Prema, and establishes Prema in the heart of the individual, in the fabric of society, and in the complex of nations. Humanity has lost its way and is shivering in terror of the evil it has generated by its insane notions. Baba’s Grace, Baba’s Prema, is here to allay the neurosis and return humanity to the Light. It was 1958. 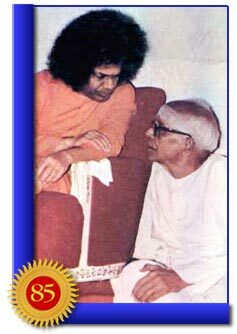 The second sixteen-year period in the earthly life of Bhagavan had now past. The task of Upadesa was to begin. A monthly magazine to carry His teaching to the four corners of the world was born. He named it Sanathana Sarathi, the Eternal Charioteer. 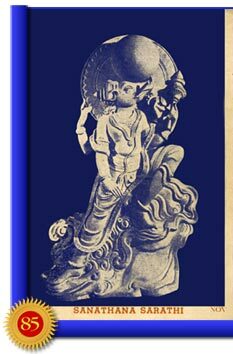 The name has the fragrance of the Gita, calling forth the divine charioteer, Krishna, the supreme preceptor of man. 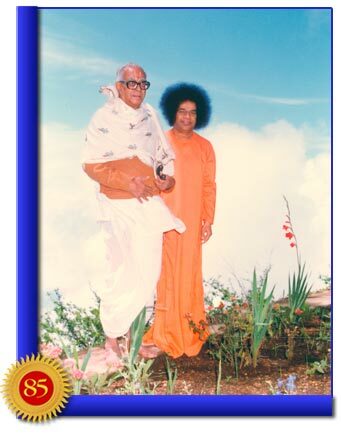 A collection of teachings written by Bhagavan Himself graced the monthly magazine. These were presented in serial form. As love is the basis of being, it was fitting that Baba named the very first of the series “Prema Vahini” or the Stream of Love. It was epoch-making. Imagine God writing papers. Imagine the Bhagavad Gita written by Krishna Himself rather than told by a third party. Visualize Rama’s story in His own handwriting. The Avatar, Bhagavan Baba, has rewritten the destiny of man, saving humanity from peril in the Kali age. “From this day, our Sanathana Sarathi is on the march, leading the army of the Vedas, the Upanishads and the Sashtras in the campaign against falsehood, injustice, viciousness and evil – the minions of the spirit of selfishness. In his book ‘Loving God’, Prof. Kasturi has narrated how the idea of the magazine was introduced to him. 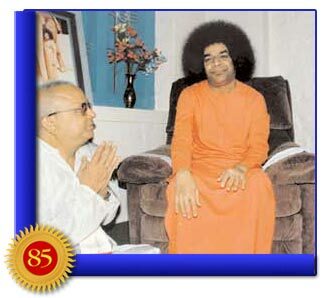 Earlier, he had retired from the teaching profession and was comfortably ensconced close to Baba in Puttaparthi. As he was well known in literary circles, he was offered a position as programme director for the Bangalore Broadcasting Station. He had wanted to refuse but Baba persuaded him otherwise saying that his talents must be put to use. Some 15 months later, his exile to Bangalore would draw to an end. Kasturi writes: “I got the good news pretty quick: Baba was coming to Bangalore. He would stay in Mr. Vittal Rao’s house. That was five minutes from my residence. Furthermore, I learned that Vittal Rao was having his door and window curtains cleaned in preparation for Baba’s visit. I tipped the dry cleaner, who was doing the cleaning, to inform me as soon as he delivered the curtains back to his house. “When I received this news, I posted the little daughter of my domestic help on a slab of stone facing his house, with directions to keep watch for a big car and an orange robe. So within ten minutes of Baba stepping into his house, Vittal Rao was amazed to find me on his veranda. “‘Wait! Wait!’ he pleaded. But Baba spotted me. With a smile He came towards me and placed His hand on my shoulder. “Now, you have to work at Puttaparthi,” he said. “A monthly magazine will start soon. Guess how is it named?” He asked. I confessed I could not delve into His Will. Yet He drew out from my reluctance a few names. So I offered ‘The Godward Path’, ‘Karma Dharma’, ‘Premayoga’. He waved aside my suggestions and announced that he had decided on ‘Sanathana Sarathi’. How did Sanathana Sarathi reach millions? With Baba’s monthly input of divine teaching, the number of subscribers shot up. This was at a time when Puttaparthi did not have a single good road, when this rural hamlet lacked even electricity. But Puttaparthi did have an old manual typesetting letterpress machine that took a skilled person a minimum of two days to compose one page. Posting the magazine by the 16th of every month with the help of only one assistant was an ordeal of gargantuan proportions. Kasturi prayed for the Lord’s blessing every minute. How complex was the process? And how did it actually get done every month in time? Prof. Kasturi gives this first-hand account: “For about a year, Narasimhachari, the sole helper at the treadle, put together the types, prepared the pages and pedalled away to get two pages printed at a time. I would offer to help him in the composing and in the footwork whenever I found him delaying or dozing. I was often shocked when he accepted the offer each time I made it. The job was really hard, although he lightened and brightened the task by singing bhajans to himself. “I was kept busy most of the day and even a few hours of the night. The number of subscribers increased fast. Money was sent by post or paid direct by devotees and pilgrims, who found the magazine their link with the Lord. 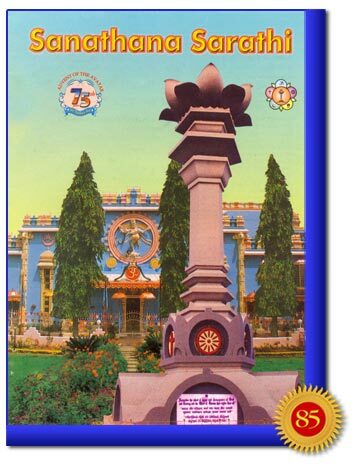 “With every festival at Prashanti Nilayam, the register of subscribers became more voluminous. Thousands who came to the Holy Presence wanted the words of the Lord to enter their homes every month. A cylinder press was brought to Prashanti Nilayam to cope with the need to produce 3,000 copies of the magazine per month. But there was no cutting machine to trim the pages. The pages were trimmed at Bangalore, a city 100 miles away. Kasturi shares: “Every month, after the printing was over, I stuffed the quantity of English and Telugu magazines into two gigantic boxes and took them to Bukkapatnam on a bullock-cart. There, I had them lifted to the roof of the bus that proceeded to Penukonda. I ordered the bus to stop near the level-crossing 300 yards from the Penukonda Railway Station. The boxes were brought down from the bus, and then Narasappa, a Tarzan of a porter, carried them as head load to the platform. “There, I awaited the arrival of the passenger train to Bangalore and booked the boxes as freight. After 85 miles of travelling by train, I would reach Bangalore station. Porters loaded them onto a horse-drawn vehicle, which I directed to a Press that had a cutting machine. The boxes filled with trimmed copies were then taken to the house of a devotee in the heart of the city where I spent the night. There, a dozen young men volunteered to put the magazines into wrappers with the addresses already affixed. These I had brought with me from the Nilayam. The copies were thus ready to be posted and we could sleep through the remaining hours of the night. However, the task was not all drudgery as Prof. Kasturi reports: “One evening in 1959, Baba sent someone to bring me to His room at the Mandir. Baba told me that the editor of a daily published in Hyderabad had asked for my photograph. He was announcing me in his paper as the editor of Sanathana Sarathi. Baba had promised to send him my photograph. He asked me to prepare myself - for, in a few minutes, He would take the picture Himself with a camera He had specially selected for the purpose. O! My joy knew no bounds! I rose to the eighth heaven. I rushed down the eighteen steps to reach home for a quick facelift. “I returned within minutes, shaved and starched, with a big broad smile on my face. Baba held me by the shoulders and positioned me at an appropriate distance. He peered through the lens and congratulated me on my photogenic face. I was elated. My picture would catch the eye of 30,000 readers all over Andhra Pradesh. My smile swelled into a toothless grin. Baba gestured and I swallowed the grin in one gulp. He cautioned me with a ‘steady’ followed immediately by a ‘ready’. “He clicked. A black hairy blotch with a flashing tail bounced on my neck from inside the camera. With a shrill screech, I hopped into the corner of the room casting away the horrid thing. Was it a rat? Was it dead? No. It was a cotton mouse that was cunningly tucked inside the dummy camera, to be shot out when clicked. Baba had a hearty laugh at my panic. I too laughed to relieve the tension. 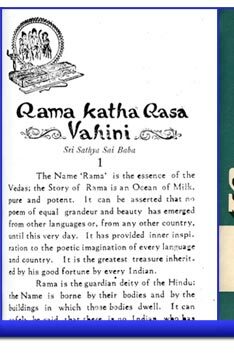 As the series of essays that comprised the Prema Vahini were being composed, other articles by Baba began to appear in the magazine. Next came the Dhyana Vahini, and then the Prashanti Vahini. Eventually 15 vahinis, all written by Bhagavan in serial form, graced the pages of the Sanathana Sarathi. These streams of divine guidance poured forth for over 25 years. 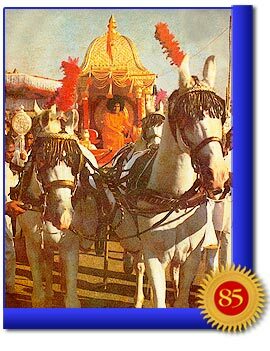 In February 1963, Baba completed the 13 essays of the Dharma Vahini. 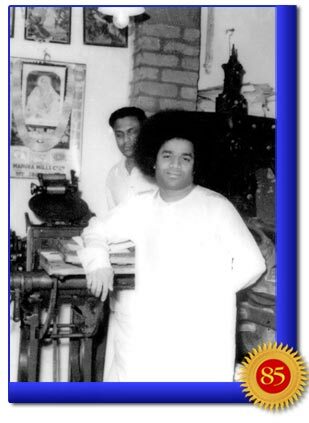 Here is Prof. Kasturi’s description of that time: “Immediately, Swami started another Vahini. I would proceed to His apartment every month to offer Him the Telugu and English editions of Sanathana Sarathi. I would return with a thrill when given His contribution in Telugu for the next month’s issue. The length of the article would be exactly the same, month after month; the diction – sweet and satisfying, simple and sustaining. The calligraphy is most charming to the eye. The most complicated metaphysical conundrum is resolved by a parable or a proverb. “He decided to compose essays on the Upanishad Vahini. Now, the highest and most esoteric of philosophical thought flowed from Bhagavan’s pen in a language that a farmer, a fisherman, a potter and a carpenter could understand. “I approached His apartment. On this occasion He chose the Brihadaranyaka Upanishad to summarise and simplify. It is the biggest and profoundest of the ten. I am certain that Baba had never read it or consulted others who could talk on it. And there was no copy available anywhere within miles. “He asked me to wait in His room. He proceeded along the veranda with a notebook and pen, towards the room where stood only a table with a chair and nothing else. Mr. G. V. Subba Rao, who served in the UN Energy Division for many years, wrote a related story: “Once just on the eve of my departure from Puttaparthi to catch a plane that next morning in Bangalore, I was called by Swami to His modest living room in the upstairs of Prashanti Mandir. “I was then a resident representative of a UN agency in Delhi. While there, I happened to be studying the Thaittireeya Upanishad during my spare time. Baba had no way of knowing this, yet He expounded for nearly one full hour on the essence of this famous Upanishad. “When I began to write it all down, Baba remarked that there was no need to take notes. He assured me that whenever there was a necessity, I would automatically recall His teaching. For many years, Sanathana Sarathi produced as articles experiences from devotees. Every literary piece had to pass strict conditions of authenticity. But as devotees’ stories started pouring in profusely, it was difficult to establish which ones were truly authentic and not a piece of augmented imagination. As a consequence, the acceptance of articles from readers was reduced and soon became rare in the magazine. “In the evening of 21 December 1958, Baba arrived at the Kovalam Beach, accompanied by members of His entourage as well as many devotees from Trivandrum. At a quite spot on the seashore, far away from the noise and bustle of the capital, Baba gave those around Him, the unique pleasure of hearing Him sing a number of songs. Everyone joined in the bhajan that followed; during the bhajan, Baba created from the sands a beautiful image of Murali Krishna and a gold ring with the Radha-Krishna motif embossed charmingly on it. 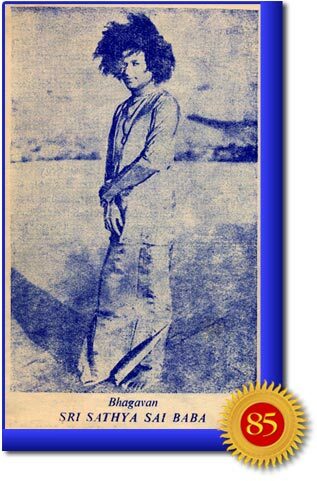 Over time, Sanathana Sarathi garnered a number of subscribers on its own merit. Baba did not favour campaigns to enlist subscribers, donors, or patrons. He would not allow the acceptance of subscription fees for more than one year. He wanted readers to decide for themselves whether they wished to continue the diet that was placed before them. Baba rejected a proposal to post letters to subscribers cautioning them that if they do not pay for another year, the subscription would lapse. There was a further stipulation governing the magazine’s operation. In the very first issue, the announcement was emphatic: ‘No sort of commercial advertisement is allowed to be published in this magazine.’ This rule has been followed ever since. 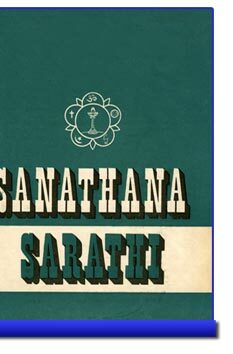 It is now over 50 years since the first issue of the Sanathana Sarathi was presented to the world. The mode of production since then has gone through several changes. As the subscription numbers grew to stratospheric heights, the need existed for a more efficient infrastructure. In 1973, the entire printing and posting operation was shifted to Bangalore. Some ten years later, it was returned to Puttaparthi and occupied a few rooms at the Eswaramma High school. Finally, the printing operation found a permanent housing in a spacious location on the campus of Prashanti Nilayam. Here, the Sri Sathya Sai Press operates today with the latest offset machine and a string of volunteers to help. 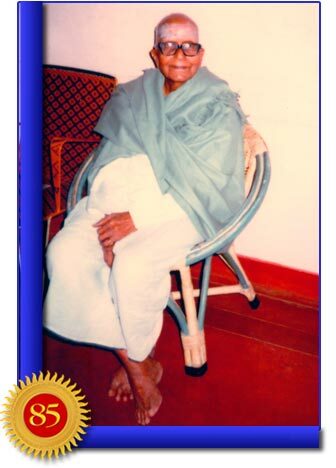 With the passing of Prof. Kasturi in 1987, Baba appointed late Mr. V. K. Narsimhan as the editor. He was a widely-travelled journalist who had served in three national newspapers of India for half a century. He was the right man for the job at a time when the Sarathi was becoming increasingly international. 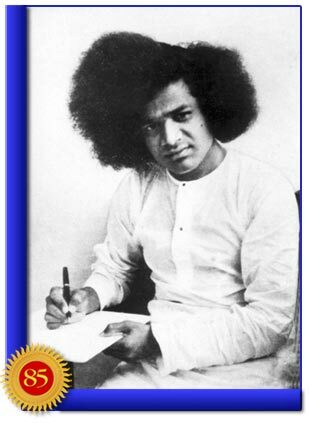 The magazine, by then, was being published in English and Telugu from Prashanti Nilayam and in other Indian languages from their respective regions. It was also translated into many foreign languages and published in their respective countries. 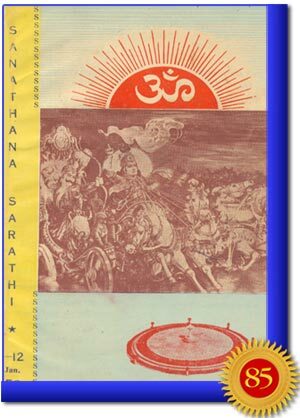 By the early ‘90s, the Sanathana Sarathi was available in Greek, Spanish, Japanese and Russian and other languages. Prior to the procurement of the offset press, Mr. Narasimhan would call the magazine a ‘monthly miracle’. It was amazing how with seemingly inadequate infrastructure and limited staff, thousands of copies could be printed and shipped to various parts of the world. With the demise of Mr. Narasimhan in May 2000, Baba appointed a new editor Mr. G. L. Anand, an experienced educationist who has served in the National Council of Educational Research and Training for decades. He is an ardent devotee of the Lord. Even though Baba stopped writing comprehensive articles for the magazine after October 1984, His involvement and interest in the magazine continued to be as spirited as ever. Be it the front cover, the inside photos, His discourses or devotees’ articles, every detail was Baba’s concern and under His direction. But all earthly things do change. 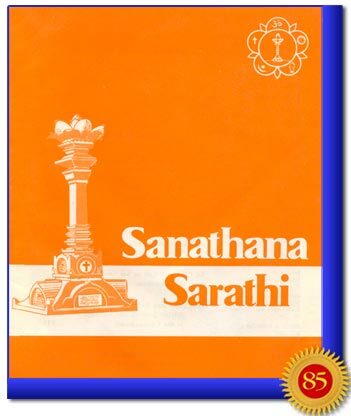 After more than a decade in orange, the cover of the Sanathana Sarathi now commemorates in vivid colour the images of the Super Specialty Hospitals, the Sarva Dharma Stupa, the Chaitanya Jyothi Museum, and other symbols of His Divine Mission. What the Sanathana Sarathi has achieved is comparable to that of Bhagavan’s massive projects. For over 50 years, it has worked on a different dimension, subtly altering the mind, bringing out the best in each human being, and raising the consciousness of man to a new realm of peace and bliss.